Vacation rental condominium. Sleeps 10, 3 bedrooms, 4 bathrooms. Dogs allowed. St. Kitts Penthouse (for 10 people) features three bedrooms and four private baths. The master bedroom has a king bed, the two guest bedrooms each have two queen beds. The living room has dining area. This unit has a fully equipped kitchen including microwave, blender, dishwasher, washer/dryer, and breakfast bar. Living room and one bedroom has sliding glass doors which open onto a private balcony overlooking the water. Other room features are central A/C, ceiling fans, large walk-in closets, cable TV in living room and bedrooms, iron and ironing board, hair dryer, and beach towels. Pelican Landing’s heated swimming pool is surrounded by a sundeck. There is a minimum stay requirement on weekends, during special events and holidays, and during season. Overall a good experience, room is a little dated needs some minor tlc, floor tile damage etc. only problem we had was with the dvr/vhs player. brough some movies with us to watch spent half an hour trying to get co axel cables to work ending up damage a tv playing with stuff I shouldn't have to deal with . but rooms were spacious and clean overall had a great vacation. Overlooking the bay was a treat! Amazing amount of room in this condo - cannot stress that enough. Plenty of towels. Location was great, but a tad far for walking to Duval on hot days. The aquatic life right there was impressive! Our only negative remark that I feel a need to post is the furniture is sooo bad - not clean, broken down, etc. However, our beds were comfortable. We had 6 people in our party. This location was perfect. We found the property to be clean, the management was very good as well. I would rent here again. We had plenty of towels, AC,and the kitchen was nicely appointed. The room was tidy and clean. And a great location. The best part was the the mellow cafe next door. Amazing food and an awesome beer selection. Our only complaint about the condo would be the wifi would not connect. Loved everything about this stay. Place was clean, quiet and had everything we need for a wonderful time in Key West. Walking distance from everything we needed!! The St. Kitts was a great space to accommodate our extended family for vacation. Highly recommend and would stay again. Excellent place for boaters to stay. The penthouse was perfect for our visit. Plenty of room for all of us to spread out, very comfortable, friendly and accommodating staff. It was perfect! Stay here often. Great location if you are a boater. We always come with groups and enjoy the ability to cook and grill on site . Staff is always accommodating. Ashley was very helpful this last trip when we arrived. We had a fabulous girl trip to Key West! April is perfect weather! Very roomy with enough rooms, beds and bathrooms for 7 women. Great trip! The unit was nice but a little tired. The unit was spacious. The WiFi could be better. The water pressure needs to be improved. Just a heads up to the maintenance folks. Overall a very nice experience. we had an awesome stay and vacation in Key West at this property. We had a wonderful time and the rental was amazing! We thank you and will be contacting you in the future! The spot was great. Plenty of space for the 5 of us and very comfortable at that. Two patios were great with good views. Good location to get everything one would need. Was clean and had everything one would want. Recommend for groups of 5-10, great place! We were very impressed with the unit it was perfect for 3 couples. Very clean and also very quiet. Condo was in a great location and served our groups needs. The patio and view were amazing. It was about a ten minute bike ride to beaches and Duvall street. We would definitely book this condo in the future. It was nice. Pool was pretty dirty but other than that everything seemed fine. It is a little far from duval and Mallory square so we had to Cabot down there each time. Nice condo. Great balcony to enjoy the view. Convenient location. The condo was clean and well maintained. The office staff was friendly and accommodating. Kitchen was well equipped. Plenty of room for our group. Only complaint was poor water pressure/not enough hot water in one of the bathrooms. Our rental experience was very positive. The unit is in great shape and is extremely spacious. We have 7 total people in our group and everyone had enough space to move around and store all of their luggage. The kitchen was great for us to make coffee and breakfast in the morning and dinner if we wanted at night. The pictures of the condo were spot-on. The condo was nice with all necessities. The only problem we had was the water pressure. It was difficult to take a shower and the water was either freezing cold or burning hot. The pictures of the pool are a bit off too. The pool was much smaller and not as nice as expected. The location was about a 20 minute walk to duval and the peer. There was a very nice cafe right by the condo for a quick and nice meal. We didn't find it until our last day, unfortunately. The area and condo was very quiet and the view was amazing. Condo was also very roomy and bright. Overall, very nice. Pelican landing Key West was an amazing place for my family to stay in. It literally had everything we needed from kitchen supplies to washer and dryer. I'm sure we'll stay there again when we go back to Key West! I was pleased with the appearance of the property.Upon opening the door,it was a pleasant surprise.Sometimes the pictures are misleading,but in this case they were very accurate. Great experience! Property management were helpful and very professional! condo was clean and roomy. Upstairs bedrooms could have been a bit cooler, but overall had a nice stay..
We stayed in the St. Kitts penthouse. The condo is a little outdated but we enjoyed it more than we enjoyed Tranquility Bay (a newer place) in Marathon. It was very roomy. Nice view. The management could not let us check in early but she allowed us to use the pool and bathrooms until our condo was cleaned which was very helpful. There is central air but also window units in the bedrooms which we liked because it kept us cooler and blocked noise. I would recommend this place to a large group due to location (a mile from Duvall), the number of bedrooms and the cost. We had a great time here. The condo is located about a mile away from the downtown, wharf area, but we rented bicycles for the week and found little difficulty with getting around. The condo was large, clean and fully equipped. We found everything that we needed to enjoy the pool, plenty of TV's and good cable service. The only complaint was poor internet service. We did have a loud group come in on one weekend, but we did not hear them in the room, only the hallway and elevator. We had access to the dock, but we did not use it. The charter boats are located in the same area. The Police and Fire station is located across the street. While there we enjoyed the golf, sightseeing, a ferry ride to the Dry Tortugas, snorkeling and a helicopter tour. Perfect location with great view! Overall, we loved the condo! Perfect location with a great view. We loved watching the Pelicans and even had a manatee stop on for a visit. The condo is very spacious and views of sunrise are the perfect way to start your day! We would stay again. I really enjoyed this condo. It was in a great location. The view out of both decks was amazing! The building was very clean and the pool and deck areas awesome! BTW you get 2 parking spaces which is like gold in Key West! The inside was spacious and clean. Nothing bad to say! I would definitely rent it again. The bottom line: This Condo is a great place to stay, just on the periphery to Duvall Street action. It was not lost on my family the attention to details - clean towels, piping on the furniture matching the pillows. The rental agency was top-notch too! I will refer all that I know to Pelican Landing without hesitation! We have stayed in the St Kitts penthouse in the past. It is a beautiful condo and is very well furnished. We brought our son, his wife and our grandson along on this trip. Having three bedrooms and four bathrooms was perfect, Everyone had their own space. We all enjoyed our stay and will definitely stay there again. The place was very spacious and conveniently located. However, the place is about 20 years outdated. The tube TV's were a pain to work and the elevator to the 4th floor was very slow. Other than those 2 things the place was nice. Excellent. Place was better than I expected and is a great location. Very professional, very clean and nice units, needs a little maintenance on some items. A little pricey but nice. The view was spectacular. Definately recommend and probably will be visiting again. Wonderful place to call home for a few days, a little to far from Duval street if that is where you are planning to hang out. We enjoyed ourselves! Very good accomodations and excellent views. The place could use some updating & upgrading, but it was 12 of us there for 3 nights for our grandson's wedding. It was very spacious, the view was fantastic, the kids enjoyed the pool, we were close to the wedding site and Duval Street, and the staff was great. I had 6 people stay in this apartment during my weeding at Casa Marina Hotel; I must say that the house made it a perfect trip. The house was better than in pictures. Everything was clean, organized and very precise. I would definitely recommend this apartment for any stay. We stayed here for 3 nights during the 4th of July weekend this year. Usually us girls go to a new place every year for a reunion but this year we brought along our better halves. All 6 of us had a great time at this place. It was perfect because we all had separate rooms and bathrooms and an extra! We also liked that there was a kitchen for us to make breakfast and a big dining table to sit and eat at before we headed out for activities all day long. The view from the balcony was also very nice. It is a little far away from everything but we rented bikes from the nearby store for our entire stay and then it was only a 10 min ride to anywhere on the island. If you're not into biking, you can also call a taxi which will take you anywhere for 4 bucks per head. Overall, I would stay here again if we visited Key West. On a side note, it was probably not the best time to be in Key West in July. The weather was so humid and it was so hot that we all got sun burnt. The only problem I had was with the continuous breakdown of the elevator. After reviewing many potential residences for our family, we choose Pelican Landing for it's location and accommodating size( we were 10). We found it to be above average in affordability; it met that need for our family. 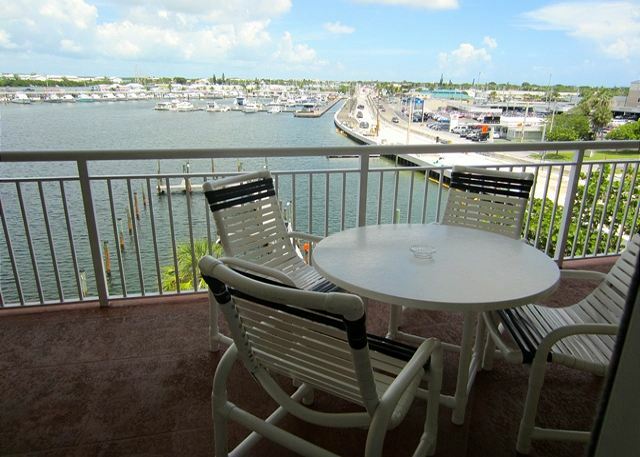 The condo was within easy driving distance to the beach,and walking distance to the center of town. The only complaint we had was that the pool water was very hot(well over 100 degrees) when we arrived,as the heater was on. The staff promptly notified the commission that is responsible,and it was improved by the next day. Good location, spacey and clean apartment. A bit worn out, but everything fully functioning. Food stores nearby. The town reachable by foot / bike. Excellent value for money. Very clean. Lots of space. Kitchen fully stocked with dishes and cooking equipment. Great having a washer and dryer right in the condo. The furniture is a little worn - we all noticed it. The location is a bit further from Duvall than we are used to. However, it is only a short bike ride away and the office will rent the bikes and have them delivered. We are likely to rent here again in 2015. Hello Phil, Glad you enjoyed your stay. Hope to have you and your family stay with us again. Amazing location, amenities and more! Having been to Key West multiple times, I can honestly say that St. Kitts Penthouse at Pelican Landing was the best lodging experience I've ever had. From the location to the amenities, our entire group (of 10) was over the moon. The front desk staff was very helpful and pleasant to deal with and the condo was extremely clean and well stocked. We are all looking forward to returning next year! Hello Michael Lynn, Glad you enjoyed your stay. Hope to have you stay with us again. We loved the spacious condo and the location. It easily housed our 10 family members, and we enjoyed the pool and barbecue. We even got a visit from the manatees. Manager was very helpful. There were some maintenance issues, but not serious enought to spoil our enjoyment of the facility. Whole family in KW for my son's wedding. Had a great time and place was big enough for all 11 of us. It is in dire need of repairs. Had 7 friends stay in the St. Kitts for a long weekend. Rooms were great - there was a lot of space for all of us, with plenty of bathrooms (4), balconies, kitchen, etc. Never felt crowded the whole weekend. Some construction on US 1 made it a little difficult to get to the building (didn't hear the construction inside the rooms at all though) and the elevator broke down were the only downside. Had a nice pool and patio area, and a great view. Tried to walk to places downtown the first day, but gave that up. It's a little too far to walk. Weekend was too short! Wish we could go back already. Fantastic place! Can't wait to return for another stay! Courteous and professional staff, loved the 2-story loft unit, fabulous deck overlooking the harbor, clean and warm pool, enjoyable poolside area, very spacious housing unit, all of our family just loved it. Roomy, open, great amenities, liked off-street parking, very clean and appealing. We want to return! The master bedroom had an old bed which could be better! Great days in Key West! Large, clean and overall very nice apartment. Great service and nice pool area. The condo was about a mile from Duval Street and the tourist area. We liked being close in. The view off the balcony was beautiful, overlooking a marina. The staff was helpful and kind. The unit was clean. The staff were very friendly and accommodating. The location was good and we (8 ladies) felt completely safe. We walked everywhere with the exception of the grocery store. The house was in excellent condition. I would definitely book this same location again. The property is about 1 mile from the excitement of Duval street and the beach. I would recommend bicycle rentals. The property managers were excellent and more than happy to offer recommendations and help. The property itself was very clean, updated, and had tons of space. The upstairs two queen bed room had a faulty AC, but with the cool Key West breezes, it was not necessary. One odd complaint, none of the TVs had remote controls. Overall, it was a great stay! The place was very clean and had a deck beautiful views. Thoroughly enjoyed the stay. It was walkable to duval street, although a little over a mile walk. St Kitts is a beautiful condo, with great location right in the middle of key rest! The condo was in great shape, clean, balconys were great, pool area was perfect, and loved the fishin dock! Can't wait to go back!! Hello Russell, Glad you enjoyed your stay, hope to see you and your family again soon. We enjoyed our stay. Wish it was a little closer to Duval St., but it really was not an issue. Hopefully next year the street construction will be finished. It was a pain having to take a several mile detour to go just down the street to the grocery. Not Pelican Landings fault, roads have to be kept up. I really liked that our small dogs were allowed to stay. Although pets are allowed, the place does not have a pet smell. Very clean. some things need attention and more care needs to be given to our unit. It is looking very tired!!!! Nice location, worth the money if you have at least 6-7 people. Pelican Landing was overall a nice stay. There are actual pelicans that hang out on the docks. The St. Kitts unit was very spacious, and was supplied with some basic necessities like laundry and dish soap. Some of the walls need a new coat of paint and some drywall repair, and the tile floors were fairly dirty, but it was air conditioned, and close to all the attractions. Overall I would recommend this location. I was overall pleased with my stay. The elevator is in need of some maintenance. The rental unit was fine - the living area was spacious and we loved that we had several balconies. We could not walk barefoot even though the floors looked clean because it does state that diesel fuel from the boats leave a film if you keep the patio doors open, and some people's feet were black - but we were warned about that in the manual. I believe the only complaint was the shower faucet in one of the upstairs rooms had problems. Otherwise, the amenities were great, plenty of utensils, glassware, dishes. The staff and service was excellent. The pool area was wonderful and we loved that we had such a nice view from our balconies. Definitely was worth the price. Thank you very much! Our group of 3 couples,were very happy with the stay at Pelican Landing. We were near restaurants and grocery stores. only 5 minutes car ride from Duval. Mostly we loved the overlook of the harbor and watching the fishing boats come and go while playing cards on the veranda and having a more secluded veranda for along time on the upper level. Wonderful accommadations. Thank you. Much nicer than expected! I will definitely return to Pelican Landing again. Thanks! We really enjoyed our accomodations at the Pelican Landing. It was clean and nicely furnished. We will definetly return. The city bus was very convenient from that location since we didn't rent a car. I recommend this location to anyone visting Key West. Very nice spacious and clean condo. Within walking distance to Duvall St.
My family needed a big enough place to stay 4 nigfhts while we went to pre-wedding activities. All 5 of us loved the 3 nicely furnished bedrooms,4 full bathrooms, waterfront patio, and 2 patios outside of 2 upstairs bedrooms. Great location! We had our rehearsal dinner there, with lots of room for mingling. We especially liked the high ceilings. We have been coming here since 1988 and it has had a lot of changes and all for the better. Thanks for always making it a great place to stay. The property from the outside looks a little scary, and you walk right into a parking garage. But the condo itself was really nice. Great for groups, large space many bathrooms and beds! The kitchen had anything you needed! The downstairs bathrooms werent as nice as upstairs but we had 10 girls and it was GREAT!No one was on top of each other and the patio/balconies were great!! The pool was nice too, kept cool and great view! Not right off Duval, but we walked the 1st night and its only a 5 min cab ride for $3 per person!! We had an amazing bachelorette party!! Thanks! We were very pleased with the St. Kitts retreat, with the exception of the dirty tile floors. Since there is an automatic $200 cleaning fee for a retreat or penthouse, the place should be spotless. Walking around barefoot would leave your feet dirty. Other than that, loved the location and the convenience of having our own personal boat dock with washdown and fish cleaning station. We could go out fishing or snorkeling during the daytime and enjoy the nightlife of Duval St. everyday we were there. Wonderful property for all 8 of us with plenty of chairs, towels, dishes, and a fabulous safe location. Could use an ironing board, broom and dustpan and recycle trash can. Otherwise it had everything!